Robert Holden at South Perth Library! 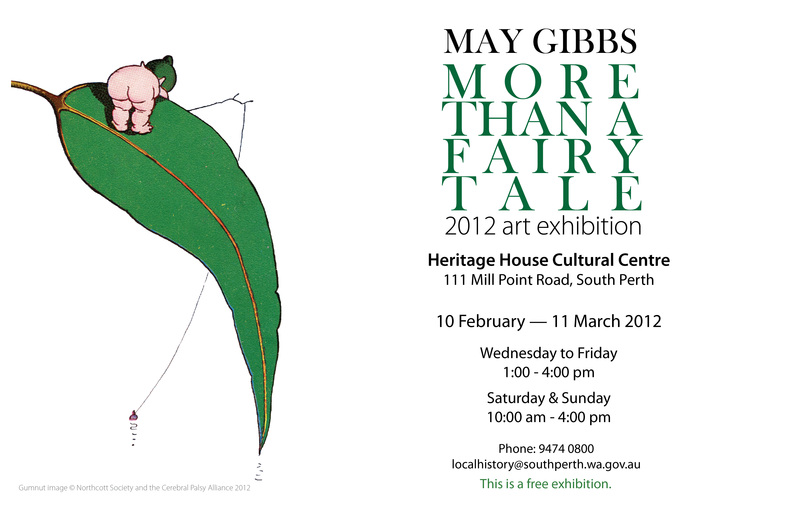 Head on down to Heritage House Cultural Centre to check out our 2012 May & Herbert Gibbs Collection exhibition. Not only are we showing off our collection, we are also celebrating the release of the publication May Gibbs: More than a fairytale, a tribute to the life and artistic endeavours of May Gibbs. The Gibbs family connection to South Perth, May’s adventures and travels around the world and the birth of the ‘Gumnut Babies’ in Harvey, Western Australia, are themes explored in this exhibition – through humorous postcards, portraits, landscapes and materials printed during World War I. Stayed tuned for details of an author talk at South Perth Library by Robert Holden, co-author of the new publication! You can also buy your very own copy by popping into the exhibition, visiting South Perth Library, or if you don’t get a chance to do either of those fun things, head on over to MillPoint Caffe Bookshop! March = history at South Perth Libraries! Our events calendar for March is going to be dedicated to all things history. I know it is only January but there are some great FREE events on offer at both South Perth and Manning Libraries and I wanted to give you all a heads-up so you can mark your calendars! For booking information and to see what other events we have on offer, visit the Library’s What’s On page. Also remember that the 2012 Local History Awards ‘Talking ’bout my generation’ are open until Friday 30 March – for more information check out the awards page. A beginners presentation aimed at building awareness and getting started on your family history. This will be an informal session comprising a presentation together with a Q&A component explaining what Oral History is and how it is used. An overview will be provided of the ‘Introduction to Oral History’ workshop and the ‘Using Digital Equipment’ workshop which are run by the Oral History Association of Australia (WA Branch). Written handouts describing the workshops will also be provided. A presentation of www.ancestry.com (library edition) showing useful databases and search strategies. Writer and book editor Amanda will be talking about her newly published book ‘Inherited’ and where the idea behind the book came from. As part of the 2012 National Year of Reading celebrations at the South Perth Libraries, we are encouraging visitors and residents of the City to record their memories of the communities, people, commerce and natural and built environments in South Perth. · Engage visitors and residents of the City of South Perth with our Local History. Entrants simply chose a sentence starter from the entry form and in 250 words or less, write a memory or story related to South Perth. The entry does not need to be reflective of something ‘old’ – the awards encourage the recording of memories and stories that are happening as we speak. What happens today will be part of South Perth’s history tomorrow! For more information on the awards, please see the brochure (includes entry form). Entries are open from January 2012 and close on Friday 30 March at 5.30 pm. The libraries are dedicating the month of March 2012 to all things history, with introductory workshops on family history, Ancestry.com and oral history. For more information on library events, please visit the Library’s What’s On page. Get talking ’bout your generation today!